GetCalFresh supports applicants through the CalFresh (SNAP) enrollment process. Our goal is to fully close the CalFresh participation gap, and ensure that every eligible Californian can have a dignified experience accessing much-needed food benefits. Today, the Supplemental Nutrition Assistance Program (also known as SNAP, or food stamps) provides $70 billion to food eligible Americans each year. Historically, California has had one of the lowest participation rates in the program, and there are over 10 million Californians who qualify for SNAP but are not receiving benefits. As one of the most successful government interventions, studies show that SNAP helps alleviate poverty and has a direct correlation to better health and educational outcomes for children. 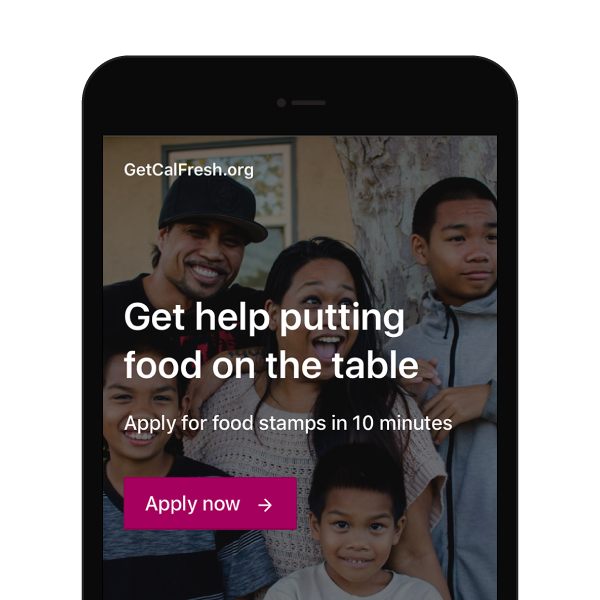 Although the application process can be confusing and difficult to navigate, Code for America’s GetCalFresh program is ensuring that everyone can access food assistance benefits — and do so with dignity. GetCalFresh acts as a “digital assister”, supporting users through each step of the eligibility and enrollment process through their mobile phone or desktop. An online application for CalFresh takes 45 minutes or more—GetCalFresh has managed to reduce the application process to about 8 minutes. Once someone has applied through GetCalFresh, they receive a text message to confirm that their application was submitted, as well as any important reminders related to the application process. But it doesn’t end there. The Code for America team continues to document barriers that users may face (i.e. requests for additional documentation or income eligibility expectations). By using practices commonly found in consumer technology, the GetCalFresh team is able to see barriers in accessing benefits and share these insights with government partners to improve outcomes. By the end of 2018, GetCalFresh will be in all counties in California. We are currently laying the groundwork for national expansion, starting with a prototype in the state of Michigan. The GetCalFresh team has partnered with dozens of counties to deliver a more dignified user experience for GetCalFresh applicants, and learned a lot along the way. A big part of our work at Code for America is showing others what’s possible—in that spirit, we’ve created this resource hub for knowledge sharing. People in need of government services are online. It just takes the right digital strategy to reach them. Connecting residents to food assistance during the Northern California fires. Interested in how GetCalFresh works? Discover how clients can apply for food assistance in ten minutes or less.